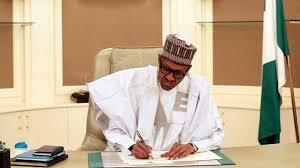 Some members of the Abia State House of Assembly have commended President Muhammadu Buhari’s courage for signing the fourth alteration bill, that granted financial autonomy to State Houses of Assembly. Recall that President Muhammadu Buhari’s had on Friday, signed the bill, which granted financial autonomy to the state judiciary and Houses of Assembly into law. The Senior Special Adviser to the President on National Assembly matters, Senator Ita Enang disclosed this to state House correspondents on Friday. Reacting on Saturday, in an interview with DailyPost in Umuahia, the member representing Umuahia South constituency in the Abia House of Assembly, Hon. Chijioke Nwachukwu, said that the President’s assent to the bill, has deepen the nation’s democracy, stressing that state legislators can now take decision rightly, without the interference of the executive. According to him, “It is a good development. Firstly, it has deepen our democracy. It has given independent to those in the States Assembly. “Prior to now, States Assembly was more of a arm of the government house. And everything they need, they will be begging state governments which never encouraged the independence of the legislative arm of government. “So with this process, the State Houses of Assembly is now standing as an independent platform to take their decision rightly and operate rightly”. Hon. Chibuzor Okogbuo, the member representing Bende South constituency, in his reaction, said that the State Houses of Assembly Financial Autonomy bill, signed by Buhari-led administration would improve the standard of governance in states in Nigeria. He said, “My reaction has always been that President Buhari mean well for this country. Because for state Houses of Assembly to be autonomous, that will uplift the standard of governance in states in the country. “And for me as a legislator in the Abia House of Assembly, i’m very happy with the President’s gesture. We have raised this matter sometime. “I’m assuring you that, with the granting financial autonomy to state Houses of Assembly, all i wish all Nigerians is that, they should expect the best legislations in all the states”. Also, speaking the financial autonomy granted to the State Houses of assembly by President Buhari, Hon. Ikedi Ezekwesiri, the member, representing Umunneochi constituency, said, the development would enhance the development of the parliament. The APC chieftain said, “That’s a very welcome development. The President is showing good leadership. He does not want to do politics with the welfare of the people,especially the parliament. “And I feel very grateful for this man of honour and integrity. The financial autonomy will change a lot of things in the various Houses of Assembly of Nigeria. “It will stop the process of the parliament carrying cap in hand, begging governors for their entitlement and all.